Virtual Staffing came into existence with the motto of helping people or businesses, with their less productive and repetitive work, so that they can concentrate on much important and productive jobs. 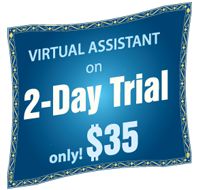 The virtual staff they hire through us gives them ultimate freedom from boring and repetitive jobs. They then can start working on their innovative million dollar ideas, and thus, make the most of their precious time. We are an outsourcing company functioning from India and have our head office in New Delhi. We undergo a strict interview which runs over a couple of days and we have been using various methodologies to study the people we are about to hire. Our hiring strategy is designed to pick the best-suited person for the job with required skills to perform the assigned duties swiftly. The staffs here are equipped with all the required technological know-how and a world class infrastructure to boost their performance. We strive hard to make our work model flawless and maintain a better relationship both within our office premises and with our clients abroad. We have worked out the best suited prices for the respective jobs and are constantly scaling ourselves to provide a highly skilled staff to work on all sorts of SEO services, data entry jobs, writing works, etc. Visit our contact page to get in touch with our representative and get all your queries answered at the earliest.